2. How soon can I claim on pet insurance? 3. Why is there a waiting period for pet insurance? 4. How long is Bought By Many's pet insurance waiting period? Pet insurance is designed to cover unexpected illnesses or accidents that occur in the future. For this reason, pet insurance companies don't offer immediate cover for any conditions. They also impose a waiting period for claims to cut down on fraud. Although it means that some legitimate claims may be excluded. Bought By Many's pet insurance works slightly differently in that we also have an exclusion period at the start of the policy but we will cover conditions experienced in it after the period has ended. Most other insurers will completely exclude conditions that develop during the exclusion period. We've listed the waiting periods for most of the companies featured in our list of the best pet insurance policies for dogs. We've included our cover for comparison and highlighted Churchill because it has a shorter waiting period than most companies. Occasionally, some pet insurance companies, like Scratch & Patch, will not apply a waiting period if you are switching from another insurer. However, most insurance companies do not offer this. The waiting period tends to be shorter for accidents. 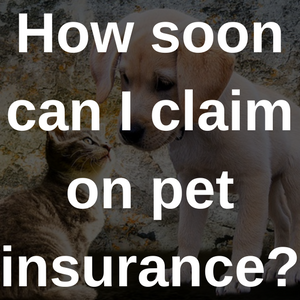 How soon can I claim on pet insurance? As you can see from our list of waiting periods, you will usually have to wait around 14 days before you can claim on a pet insurance policy for an illness. For any accidents, this period tends to be shorter. Some companies may cover you for accidents your pet gets into after 48 hours. We are not aware of any pet insurers that offer instant pet insurance cover for new customers. Find out what else is not covered by pet insurance with our guide to surprising exclusions. Why is there a waiting period for pet insurance? To prevent people from buying a pet insurance policy and immediately claiming for an illness their pet already had or looked like they were going to develop. This would be a fraudulent claim because when you take out a policy you tell the insurance company you believe your pet is healthy. And if you do know about any previous conditions, your insurer will let you know whether it will cover them or not. The problem for customers is that any legitimate claims for illness in the waiting period will be excluded and classed as a pre-existing condition by the insurer. The condition is then likely to be excluded from the policy completely after the waiting period. Waiting periods can also make things difficult if you have to change pet insurance companies, as your pet potentially won't be covered for two weeks while you move to a new company. You could overlap policies but insurance companies may not pay out if you are covered by another company. Also, this method means you are paying double for the overlap period. However, some insurance companies may allow you to start a new policy two weeks before your old policy ends. This means your pet will be covered by the old policy until the waiting period ends on the new policy. You should check with both insurance companies that you are able to do this when you come to the end of your insurance period. Bought By Many will allow you to purchase a policy two weeks before your other policy finishes and will pay out any successful claims during the final two weeks even if you've started a policy with someone else. How long is Bought By Many's pet insurance waiting period? Bought By Many has a slightly different system to most other insurers. In the first 14 days, you can't submit a claim for any illnesses or behavioural conditions. However, if something develops in those 14 days, you will be covered from the 15th day onwards. We aren't able to pay out for any treatment you received during the first 14 days but we will cover the condition going forward. Many other insurers would exclude it as a pre-existing condition. Bear in mind, though, that we still have a 48-hour waiting period for any claims for accidents. Bought By Many has also launched a Pre-Existing pet insurance policy. This can cover most conditions that your pet has suffered from in the past before you take out our cover. It does not cover conditions experienced in the three months before your policy starts and then we still have the 14-day waiting period. We are the only company to offer cover like this for pre-existing conditions. Different insurance companies provide different ways for you to make a claim. For instance, More Than's process involves downloading its Pet Insurance Claim Form. After filling this out, you send it to the company along with your vet fees and your pet's medical notes. It will then be in contact, and can pay your vet directly. Bought By Many has a slightly different process. For us, you can call our dedicated claims team who will guide you through the process of making a claim. For vet fee claims, you'll need the receipts or invoices for the treatment your pet has received (but don't worry, if you can't find it, we can contact your vet to get it). For any other claims, we can tell you over the phone what information we'll need. We'll also be launching an online snap claims system soon. This will speed up and simplify the process of making a claim. For more information on our claims process, read our article on how to claim.